13:15 Hello everyone and welcome back to AUTOSPORT Live for continuing coverage of the 15th round in the 2010 FIA Formula 1 world championship. The sport leaves Europe for a final quintet of flyaway races - the first of these being a trip to the far east for the third Singapore Grand Prix night race. A difficult first practice session earlier this evening produced little evidence on who has the right package for the Marina Bay circuit. But, tonight, we should learn a lot more about the battle between Red Bull, McLaren and Ferrari. The creatures of the night are about to come out to play and dazzle us all once again. Lap times will improve dramatically and the cars will be visually stunning, throwing up showers of sparks through the city streets as the bodywork glints under the artificial lights. 13:17 An afternoon rainstorm ensured a wet start to this weekend's event at Marina Bay. When the cars rolled out onto the circuit for the standard installation laps, some parts of the circuit were almost dry, but unhelpfully many areas of standing water remained. Understandably, it was some time before meaningful lap times were posted. Michael Schumacher - racing here at Singapore for the first time - was one of the first to put a lap on the board as he familiarised himself with the 23-turn course. Several drivers elected for an early run on intermediate tyres, but the watching world was waiting to see who would be the first to brave the conditions of slicks. Timo Glock and Jaime Alguersuari proved that it was a touch early for dry tyres, but eventually Alguersuari was able to match the best time on wet rubber. That gave the rest of the teams in the pitlane all the information they needed. The track continued to dry out and soon the leaderboard was spinning like a fruit machine as the drivers got their first running in almost dry conditions. It was clear that the last man over the line would have every chance of topping the order. Mark Webber managed to start his final lap with just a handful of seconds remaining and so he emerged as the fastest driver with a lap time of 1m54.589s. Shcumacher ended up second quickest with Adrian Sutil third, Sebastian Vettel fourth and Alguersuari in fifth place. 13:19 Weather conditions have remained fine and dry since the end of first practice. The rainfall radar is clear, showing no showers anywhere across the city-state and we are set for a dry session. The humidity level is still very high, along with temperatures. Thermometers will dip no lower than 29 Celsius towards the end of the session. Tomorrow, the emphasis of storms is expected to shift slightly. We will have a full Saturday forecast later today, on the Singapore Grand Prix Weather page. 13:21 Keep up to speed with our minute-by-minute commentary on the move with the new AUTOSPORT app. 13:23 Motor racing fans love to debate the action on track and the live forum is your opportunity to share your experiences of the Formula 1 weekend with everyone. • Will Red Bull top the second session tonight as well? • Are you glad to see Nick Heidfeld racing again? • Which of the three big teams has the formula for success this weekend in your view? 13:25 There are five minutes to go until the second practice session begins. 13:27 The track temperature is 28 Celsius, as Michael Schumacher arrives in the Mercedes garage and starts to prepare for the session ahead. 13:28 Jarno Trulli is having his belts tightened as he gets ready for his first run of the weekend, having sat out the first session. 13:29 Nico Rosberg puts on his balaclava and receives a word in his ear from race engineer Jock clear. 0 min: While at Ferrari, the drivers get more of everything! Felipe Massa has two mechanics to adjust his belts, while he sits in the cockpit waiting for the session to begin. 1 min: Alguersuari is one of the first to join the race track in the Toro Rosso, as Bruno Senna rolls out of the HRT garage. 1 min: Kobayashi, Kubica and Di Grassi are among the early runners. 1 min: Vettel, Klien, Hulkenberg, Buemi and Barrichello are all on the circuit for an initial run. 2 min: Hamilton joins over half the field already up and running, keen to get some dry laps on the circuit. 2 min: Mark Webber and Tonio Liuzzi join an increasing number of drivers on the circuit. Alguersuari crosses the line to begin his first timed lap. 3 min: Alguersuari bumps and grinds his way through the Turn 10 Singapore sling, as he continues on his first effort. 4 min: Adrian Sutil joins the track, as Alguersuari posts 1m53.406s to put the first time on the board. 4 min: Kobayashi has been for a spin in his Sauber but managed to miss the walls and has continued. 5 min: Vettel returned to the pits after one lap. Schumacher is now on the circuit, with his team-mate Rosberg the only driver it yet to leave the pits. 5 min: Hulkenberg goes second with Buemi third as the first laps continue to be posted. 5 min: Hamilton springs to the top of the early times with a lap of 1m51.712s. 6 min: Rubens Barrichello's first effort is a 1m57.164s to place him seventh. 6 min: Liuzzi is up to fifth in the Force India after posting 1m53.579s. 7 min: Massa is now third quickest, with Button up to fourth in his McLaren. 7 min: Adrian Sutil puts the other Force India in second spot behind pace-setter Lewis Hamilton, after a lap of 1m52.154s. 8 min: Alguersuari is clearly pushing the limits as early as possible. The rear end of his Toro Rosso is extremely loose under acceleration, but nevertheless he goes quickest with a lap of 1m50.637s. 8 min: Button moves into second behind Alguersuari with a 1m51.066s. 9 min: Adrian Sutil maintains his third position in the classification, with an improvement - 1m51.471s. 9 min: Rosberg joins the racetrack. His team-mate Schumacher is 13th after his first effort - 1m55.242s. 10 min: Track conditions are much-improved over the earlier session and times are likely to tumble as racing rubber goes down on the street surface. 11 min: Alguersuari returns to the pits after a reasonably successful first run of laps. He is currently quickest on a 1m50.637s. Hulkenberg jumps up to second quickest in the Williams, with Sutil third and Button fourth. 11 min: Barrichello now takes over at the top of the order, with a lap of 1m50.309s. 12 min: Ferrari are again testing with Alonso using the F-duct and the Massa without. The team will make a decision on which to race later tonight. 12 min: Button breaks into the 1m49s with a new fastest time of 1m49.768s. 13 min: Everyone has been out to at least begin a first run of laps. The exception being Red Bull drivers Vettel and Webber, who are both still in the pits. 14 min: Nico Rosberg jumps up to third position in the Mercedes, with a lap of 1m50.546s. Button and Alonso lead the pack so far. 14 min: Kubica is joining the Red Bull pair in waiting for even better track conditions before deploying his fresh set of hard tyres. 14 min: Adrian Sutil pops up into third, with a 1m49.984s lap. Barrichello is fourth and back in the pits, with Rosberg fifth. 15 min: Mark Webber is now out on the circuit in the Red Bull Renault. The Australian topped the first practice session earlier today. 15 min: Alonso is just a fraction slower than pacesetter Button with his early effort of 1m49.810s. 15 min: Alonso is even quicker on his next lap and tops the times in 1m49.376s. 16 min: Tonio Liuzzi joins Force India team-mate Sutil towards the sharp end of the classification. The Italian is now fourth, with a lap of 1m50.288s. 17 min: Mark Webber is on his first flying lap of the session, using the harder tyre. 17 min: Webber is half-a-second down on current pacesetter Alonso, after the first two sectors of the circuit. 18 min: Webber completes the lap, and moves into fifth position with a time of 1m50.265s. 18 min: Virgin boss Richard Branson is on hand to watch his team as di Grassi is wheeled back into the garage. 19 min: Vettel is back out onto the circuit and it is expected that he will be completing a timed lap very soon. 19 min: Alonso is pushing on now and looks set to make a major improvement in the benchmark time. 19 min: Alonso clocks a 1m48.661s to further extend his advantage at the top of the times. 20 min: Webber stays on it for a second lap, but fails to improve after a poor final sector. He remains in fifth place behind Alonso, Button, Sutil and Alguersuari. 21 min: Vettel crosses the line and begins a timed lap in the Red Bull. Williams drivers Barrichello and Hulkenberg have just left the pits to begin a second run. 21 min: Kubica makes use of his fresh rubber with his late entrance to the session. The Pole has set a 1m50.033s to go fifth. 22 min: Sebastien Buemi reports on the team radio that he is losing the rear end of the car under braking. He also states that he is getting some mild understeer mid-corner. 22 min: Buemi is 13th in the classification after his first run, consisting of eight laps. 23 min: Jaime Alguersuari clouts the wall in the Toro Rosso. The left rear corner of the car takes a heavy whack against the retaining barrier, but the Spaniard is amazingly able to continue. 24 min: Alguersuari had just left the pits on soft tyres. He is asked on the team radio if he feels any vibration following the incident. He reports that the car feels fine and he is able to carry on. 25 min: Meantime, Sebastian Vettel has zoomed to the top of the list after posting a lap of 1m48.559s. 26 min: Vettel continues on for a second hot lap, and lowers the bar to 1m47.824s, with Webber now in third place. 26 min: So the order is changed at the head of the list. Vettel now leads the field with Alonso second, Webber third, Massa fourth and Barrichello in fifth position. 27 min: Christian Klien comes out for a second run in the HRT. He is 23rd in the standings, marginally ahead of team-mate Senna. 28 min: Times will continue to tumble as the rubber rapidly improves the grip level. 28 min: Nico Hulkenberg completes a very solid lap in the Williams to go fourth fastest, with a time of 1m49.411s. 29 min: Vettel's time is almost as quick as the best from third practice last year, with that re-profiling at the Turn 10 chicane perhaps making the track slightly quicker now. 30 min: Vettel stays on it for another lap and posts the fastest first and final sectors. A poor middle portion of the lap prevents the German from improving his time. He remains quickest. 30 min: Mark Webber is flying and also posts 29.3 seconds in the first sector. If the Australian keeps up this pace, Red Bull will go one and two. 31 min: Webber comes through the second sector, and like team-mate Vettel, he also loses time in the middle section of the circuit. 32 min: Webber comes round the double-apex left hander and over the line to go into second place, with a time of 1m48.584s. 32 min: Robert Kubica sets his best time of the session with a 1m48.855s to go fourth quickest. 33 min: Button takes away that fourth place, but is still almost a second off Vettel's benchmark. 34 min: The McLarens are again running an aggressive-sounding, off-throttle exhaust blow from the engine to feed the diffuser in the slow corners. 34 min: Nico Rosberg moves up from 13th to eighth position in the Mercedes with a lap of 1m49.465s. 35 min: Tonio Liuzzi is pushing hard in the Force India - perhaps too hard as he clouts the wall on his latest lap. The Italian backs off to check over the condition of his car. 37 min: Hamilton has improved to ninth quickest with a 1m49.546s. 37 min: Michael Schumacher is back out for another run in the Mercedes. He is 13th in the classification, 2.2 seconds down on the quickest time set by Vettel. 39 min: Adrian Sutil is set to improve on 12th position at the end of this current lap. He crosses the line, but backed off in heavy traffic and is unable to better his time. 40 min: Hamilton has found some clear track and has set the fastest first sector, but it's likely he didn't want to clout the Turn 10 kerbs quite as hard as he did there. 40 min: Bruno Senna has improved his time to 1m56.730s, but remains in 24th position. 40 min: Hamilton completes his lap in 1m48.334s, dropping half a second to Vettel after that bump over the Turn 10 kerbs. 41 min: Adrian Sutil briefly lost control of the Force India, bringing out the yellow flags. He was quickly able to rejoin the circuit, and continue with no damage. 42 min: Michael Schumacher has improved to seventh position with a lap of 1m49.260s. He is now 1.4 seconds off the Vettel's benchmark. 42 min: Adrian Sutil is now touring back to the pits with front left suspension damage. 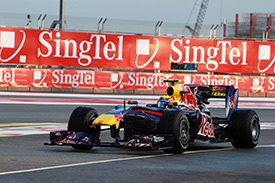 Replays show that his car was launched into the air, over the high kerbs at the Turn 10 Singapore sling. 43 min: Sutil has sensibly pulled off the circuit in the final sector at Turn 18. The damage to the front left corner was extensive. 44 min: Alonso is back out and pushing for a time in his Ferrari. 45 min: It's a 1m47.977s for Alonso, going just 0.153s off Vettel's benchmark. 45 min: The drivers will no doubt have an opinion on the kerb mounds at the chicane, having now seen several cars launched - thankfully at low speed. 46 min: Button is back out and now has the soft tyres on his McLaren. 46 min: Barrichello posts his best lap of the session so far. The Brazilian clocks 1m48.643s and is fifth quickest. Vettel is the current pace-setter and he comes out to begin another run. 47 min: So Vettel leads the pack with just under half the session left. Alonso is second with Hamilton third, Webber fourth, Barrichello fifth and Button in sixth. 47 min: Petrov is also testing the softer tyres and he improves to a 1m49.608 for 12th quickest. 48 min: Button is the fastest man through the first sector on his soft tyres. 48 min: Sebastien Buemi leaves the Toro Rosso garage to begin another run of laps. He is 18th in the classification, and has completed 15 tours so far. 49 min: The super-soft rubber is working well for Button and he finishes an aggressively-driven lap in 1m47.690s to top the times. 49 min: Alonso remains on the harder tyres and improves to a 1m47.718s, just a fraction off Button's soft-tyre time. 50 min: Sebastian Vettel is set to improve on this lap. The German had slipped to third in the standings but has posted the fastest second sector of all. 50 min: Vettel crosses the line in 1m47.168s to retake the top spot ahead of Button after a great lap on soft tyres. 51 min: Schumacher is also on his soft tyre run and looking set to improve on his current 11th position. 51 min: Schumacher moves up a couple of spots to ninth position, after posting an improvement of 1m48.889s. 52 min: Vettel improves again as his soft tyre run continues. The German now posts 1m46.974s to extend the advantage over Button to 0.7 seconds. 52 min: Button responds to Vettel's pace with a fastest first sector, but has fluffed Turn 18 and backs off to try again. 53 min: Hamilton is now on track for a soft tyre run. 53 min: Christian Klien remains in 23rd position and he joins the track for another run. The HRT duo are a whopping nine seconds off the pace. 54 min: Hamilton moves up to fourth with a 1m47.988s on his soft tyres. 55 min: Here we go again! Vettel posts a 29.0 first sector time as his strong run on the soft tyre continues. He does it again in the second sector and looks set to extend the advantage over the field to at least one second. 56 min: Vettel is pushing extremely hard. He rounds the final two corners, and posts a 1m46.660s to take the advantage over Button to just over one second. 57 min: Mark Webber is also on the softer tyre, but as yet he is not able to rejoin Vettel at the top of the list. The Australian is almost two seconds adrift in sixth position. 58 min: Webber is making a better fist of it on this lap. He will move much closer if he continues his current pace. 58 min: Timo Glock is asking his team about his differential, as he thinks there might be a problem with the Virgin. He heads for the pits. 58 min: Webber crosses the line in 1m47.667s to move up to second quickest behind his team-mate. 59 min: So now it is Red Bull first and second at Marina Bay, although the gap between Vettel and Webber is just over one second. Button is third, with Alonso fourth and Hamilton in fifth place. 60 min: Robert Kubica has climbed out of his Renault as the team carry out work to his R30. 60 min: Force India has confirmed that Adrian Sutil will take no further part in the session, after his incident at the Turn 10 chicane when he bounced over the kerbs. 61 min: Kovalainen has been for a very hairy trip across the soggy run-off at the final corner, narrowly escaping an encounter with the wall. 61 min: Tonio Liuzzi will now have the responsibility of doing the work for both drivers. The Italian posts his best first sector time, but backs off in the middle sector. He is 13th in the classification currently. 62 min: Alonso is now out for a run on the super-soft rubber. He's currently fourth quickest on his earlier, hard tyre effort. 62 min: Bruno Senna has jumped up to 22nd position in the HRT recently, with a best lap of 1m54.725s. Replays show that this run isn't error-free, as he takes to the escape road yet again. 63 min: Massa is also now on the softer tyres as Alonso begins his flying lap. How close can he get to the Red Bull pair? 64 min: Barrichello is on a soft tyre run for Williams, and posts a personal best first sector time of 29.0 seconds. He is set for a slight improvement in time. 65 min: Barrichello roars through final corners under the lights and over the line in the 1m48.372s and therefore does not improve on his current sixth position. 65 min: Nico Hulkenberg is similarly on the run and aiming to improve on 11th position. Like Barrichello, he is testing with the softer tyre. 65 min: Alonso is the fastest man through the first sector on his soft tyres as he tests without the F-duct this time. 66 min: Hulkenberg posts to personal best sector times, but elects to pit. He remains in 11th position. 66 min: Alonso has dropped a tenth to Vettel through the middle sector .... but he's got it wrong at Turn 18 and is down the escape road. 67 min: Sebastian Vettel rejoins the fray. No-one has been able to come close to his 1m46.660s best time. 67 min: Alonso has reversed back onto the circuit but now appears to have stalled the Ferrari. 68 min: Alonso climbs out of the car, with marshals finally arriving to take over the recovery of the Ferrari. 69 min: With just over 20 minutes of the session remaining, it is unlikely the Ferrari will be recovered to the pits in time for Alonso to resume. 70 min: Alonso was on course to get close to Vettel's benchmark, but it all started to go wrong as he ran wide at Turn 17. 71 min: Heikki Kovalainen leads the new teams battle for Lotus. The Finn is in 19th position, with a best time of 1m51.878s. Glock is in 20th position, just over one-tenth of a second slower. 71 min: Yellow flags are finally cleared after the marshals have cleared Alonso's car behind the barriers. 74 min: Red Bull continues to dominate with 16 minutes left in the session. Vettel tops the list with Webber second, Button third, Alonso fourth and Hamilton in fifth place. 75 min: The improvements in lap time are few and far between now, as the teams focus heavily on high fuel preparation for Sunday's race. Nico Hulkenberg is out on the track for Williams using the softer tyre. Sebastian Vettel is also on track completing a long run of laps, but has not been able to improve on his benchmark time for a while now. 79 min: The majority of cars are on track with just over 10 minutes remaining for a run to test the durability of the super-soft tyre. 79 min: Massa is in the Ferrari pits for some set-up changes at the front of his car. The team say he's not particularly happy with the balance. 81 min: Tonio Liuzzi comes into the pits at the end of a soft tyre run. It is a full formation lap and start test as he vigourously generates heat into the rear tyres entering the pitlane and subsequently practices start at the exit. The Italian launches away from the single box at the end of the pits and rejoins the circuit. 81 min: Alonso has returned to the pits on foot and the Spaniard will not be happy about losing his flying lap on super-softs and the final 20 mins. 83 min: Liuzzi is clearly running with high fuel as Force India looks to gather data for the early laps of the race. He continues. 83 min: Sebastien Buemi joins the racetrack for a final run of laps with 6 min to go. He is currently 18th in the classification, just behind team-mate Alguersuari. 85 min: Massa's changes are complete and he is back out of the Ferrari garage for a late run on used tyres. 86 min: Hamilton has been in the McLaren pit for a change of nose as he back-to-back tests the new front wing the team has brought here. 86 min: Kubica is finally back on track after lengthy work to fix a hydraulics glitch. He will be going for it on fresh, soft tyres. 88 min: Jarno Trulli posts his best lap of the session to move up to 22nd position. The Italian manages 1m53.526s to move away from the HRT duo. 89 min: Kubica has found a nice clear piece of track and sets a quick 30.0s first sector as he benefits from fresh rubber on a grippy circuit. 89 min: Kubica remains down in ninth after a poor end to his lap. 90 min: The flag is out to wrap up Friday practice in Singapore. 15:00 Sebastian Vettel continues to hammer around as the fastest driver in this session. His sector times have been nothing short of stunning in high-fuel trim. 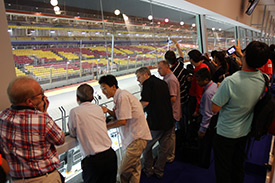 15:01 Vettel ends the first day of competition at Marina Bay as the man to beat, with a fastest time of 1m46.660s. 15:02 The Red Bull is clearly working well at this circuit. Webber was second, six-tenths of a second down on his team-mate. 15:03 Jenson Button was third for McLaren, but his best lap is just over one second shy of Vettel's benchmark. 15:04 Alonso ends the day in fourth position, but who knows what time he could've produced, had he not run off the circuit. 15:05 Lewis Hamilton ends the first day in fifth position, with Barrichello sixth, Massa seventh and Rosberg eighth. 15:05 Robert Kubica finally managed to get out on track for a short run at the end, winding up ninth. Schumacher rounds out the top 10. 15:11 Red Bull monstered the opposition this evening, with Vettel showing relentless pace both in high and low fuel trim, but Alonso was on course to offer the best challenge before his faux pas at Turn 18. McLaren is in the mix, but may struggle with the sheer pace of the quickest trio. On the evidence so far, Hamilton and Button will need to push extremely hard just to stay in touch. Will the pecking order stay the same during Saturday's final practice and qualifying sessions? 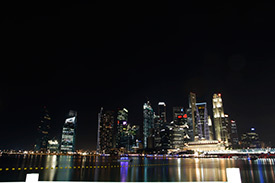 Join us for full coverage of all the action from Marina Bay, starting at 10:45 GMT.